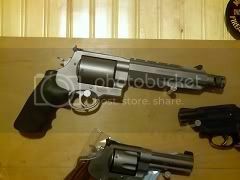 I just picked up a used 500 (4" barrel) and I was wondering if any have some suggestions on powder. My intended purpose is to keep the recoil "tame", and by that I plan to use heavier bullets (> 300 gr). I saw in another thread BillT recommended H-110 for heavy bullets, so I'll check that out. Are there any others that one could recommend. I am getting ready to start reloading some of my empty 500 cases. From experience with other handguns I recommend that you go to the reloading charts to find your loads; once you have the load data in front of you check out the powder specs; and choose the fastest burning powder from the charts. By the way: 300 grain is a very light bullet for the 500 magnum. I have seen one recipe for that light of a bullet, but most are in the 400 to 500 grain bullet loads. Fast burning powder gives less felt recoil, and in a short barrel it provides the best speed. In my open gun I notice that fast burning powder not only is easier to shoot, but it also provides more consistent cycling of the action. Also, with the large compensator I notice far more muzzle flash with slow burning powders, which tells me that they are losing more energy after the bullet is out of the barrel. Please share your results, so I can learn from your experiments when I start - I have the press and dies and LOTS of empty brass. While all the powders will push a 300 grain up to 1600 fps, H110 and Accurate Arms 1680 are the only two that will reach 1750 fps. All six powders will go 1000 fps to 1300 fps, but only the AA 1680 will go to 1350 fps. Just what I found and could be a starting point. Have fun researching and experimenting! Thanks for the info, M58. I like the pic of your velociraptor killer. Is that an 8" barrel on it? Sorry to take you from making pizza, but I hope it turns/turned out well. This is ranked in no particular order. Of these Titegroup's min is 11.0 gr with a velocity around 1032 ft/sec and a PSI of around 23K. Hmmm...I have plenty of that and I think I will start with that one to see how it goes. I plan to get some brass from Starline. Starline's site states that I should large rifle primers, which I have. This is fun stuff! As you already know, buying the commercial stuff is darn near cost prohibitive. I'll be sharing my chrono group results over the next few months as I put this together. This is one of the burn rate charts I use. There are several out there, and it is helpful to look at more than one. The pizzas were great! Homemade sauce, Italian sausage, pepperoni, green olives, mushrooms, onions, and moz cheese on the grill over wood chips. Every Saturday night since spring of 1980 give or take a few. It is a family tradition the wife and I are known for and our son has taken it to his family. Keep in mind that if you do not use plated or jacketed they must be gas checked. With this much powder behind them they will liquify quickly. The toy is a six inch Performance Center, and I have an E0Tech that tops it off. I have dropped a four year old whitetail at 150 yards with it, and it is the ultimate plinking gun - 20 lb lp tanks at 100 yards beats the heck out of pop cans with a .22 lr at ten yards. Has anyone figured out a load for the 500 with 4 inch barrel? I am using H110 with a 350 gr fmj and getting a lot of chamber pressure with a lot of unburned powder. One of the things I've learned over the years is if you have a lot of unburned powder, you need a hevier crimp or a faster powder. Try the heavy crimp first. I don't have experience with .500, but I do with .357max and H-110. At least in .357 Rem Max, H-110 will give you the highest velocities with the lowest pressures. Velocities far beyond what you can get with other powders. But that was with .357 and 10" barrel. So your problem is a much larger caliber, and a much shorter barrel. And I guess the big question is what do you want out of that 4" gun? What velocity with what weight bullet would you be happy with? Go from there. Find a powder that gives you that without pushing the pressure envelope too much.